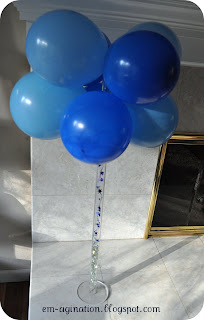 I saw some balloon pillars at a party a long time ago and decided I needed some of my own to use for various parties we have through out the year. 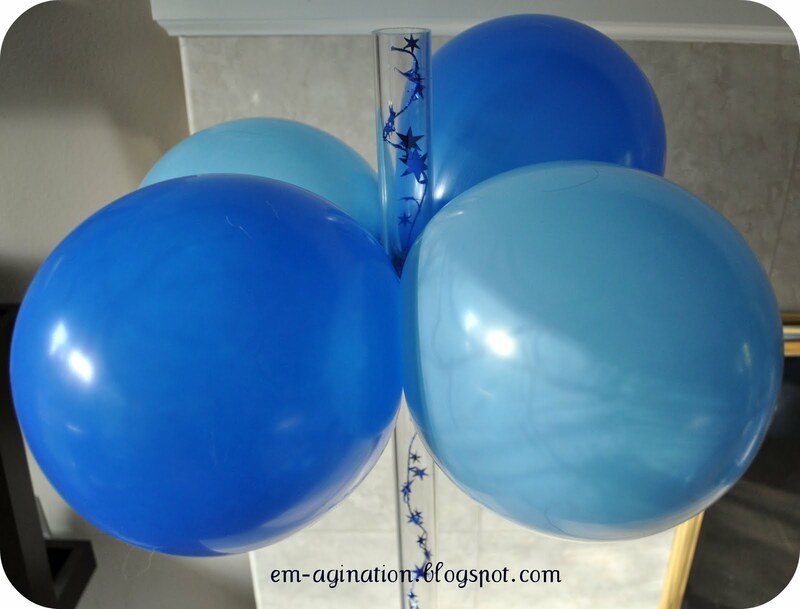 They are so versatile and you can use them to fit any party decor, you are only limited by your "em-agination." Here is how to make them. 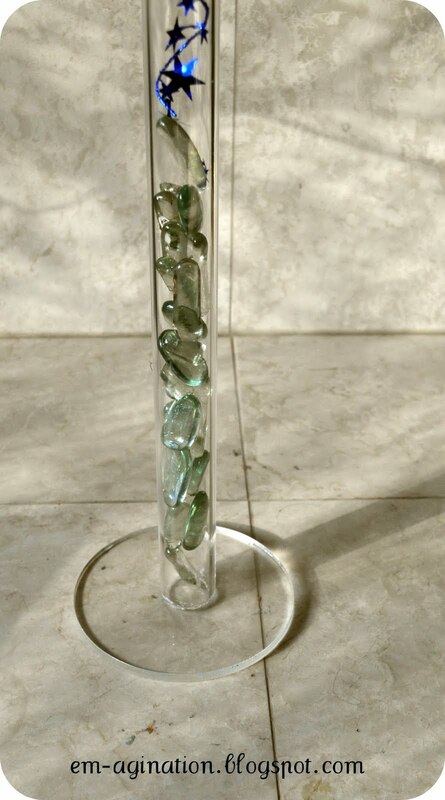 First off, you will need a pillar and a circle for the base. For my pillars I used some hallow plexiglass tubing and for the base I used a plexiglass circle. I wanted something that was sturdy and could be used again and again, plus I liked that I could integrate different things into the tubing to carry the color or theme all the way through. Each stand cost me less than $5.00 to make but you could make them cheaper using a dowel and wood circle nailed or glued together and painted. Or even cheaper, I am sure that a wrapping paper tube or mailing tube glued to a card board circle and painted would work also. As you can see, I put some glass marble things in the bottom of the tube, this was mostly to weight down the structure because the last time I used them they were outside and I didn't want them to blow away, they are pretty light. 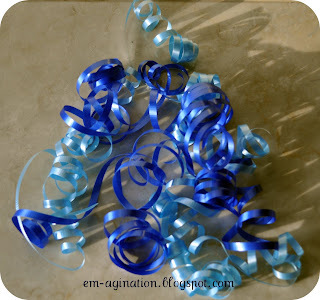 I also ran a blue star ribbon up the center of the tube just to add some intrest. Depending on the theme, you could put lots of things in the center of the tube, I have put silk flowers in the middle, candy, even twinkle lights (this of course will only work if your tube is hollow and clear like mine. 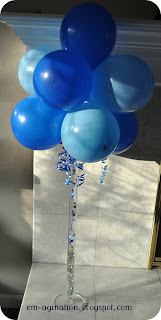 Once you have your pillar, you need to blow up 9 balloons to but on the top, you can do all one color or use a variety. 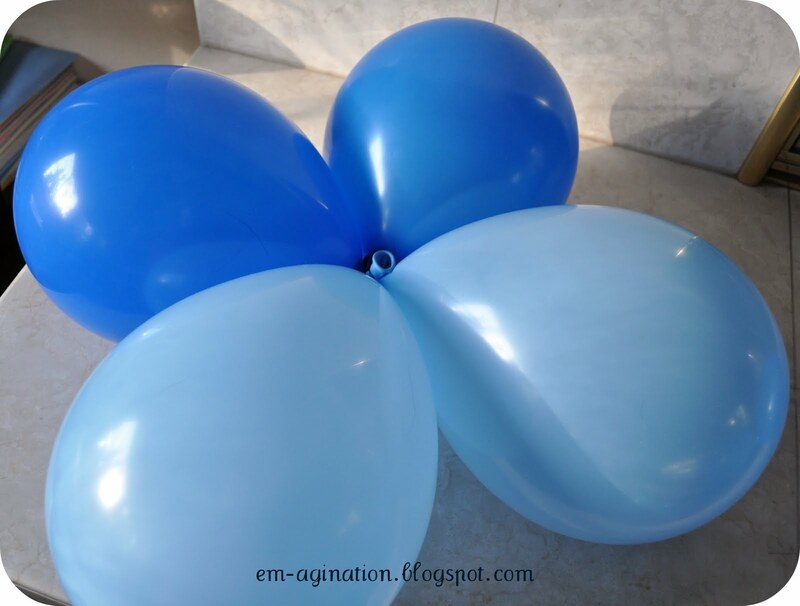 Take 2 of your blown up balloons and tie them together until you have 4 pairs. 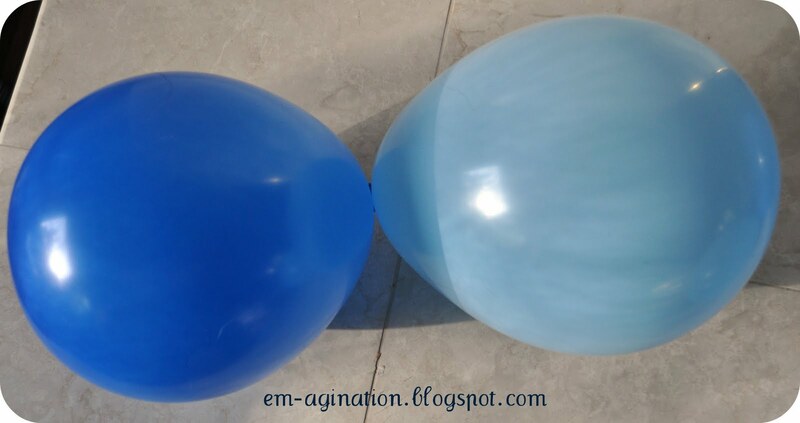 Take 2 of your pairs and push them together and then give them a twist so they don't come apart, as you can see from the pictures, the dark blue balloons and the light blue balloons were right next to each other when I pushed them together but once I twisted them they were opposite each other, hopefully this helps you envision the twisting action. 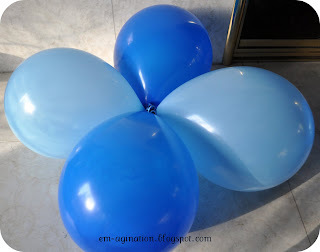 Set these 4 balloons aside and make another grouping with the 2 remaining pairs of balloons. Next take one of the groupings you just made and slide it over the pole, again I twisted the balloons to secure them onto the pole. Then take your last group of balloons and slide them onto the top of the pole so that they rest on top of the balloons you just put onto the pole, you can also twist these balloons to secure them if you want. 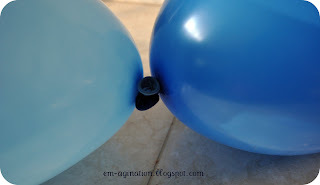 At this point you should have one balloon left, take this balloon and place it on top in the center of of all the balloons, securing in place by twisting the part you tie around the base of another balloon. Next you can fancy it up a bit, I used curling ribbon which I wove in between the balloons and let hang down but you could do anything, I have used the same wired star garland that runs in the center and made curly ques that stuck out between the balloons, I have put silk flowers and tulle between the balloons (bridal shower) and even different pennants (baseball theme) sticking out, like I said you are only limited by your "em-agination." Also, I don't do this with mine but if you wanted to cover your base, you could use small balloons, like a water balloon size and do the same thing you do on the top, at the bottom, obviously putting the balloons on the bottom first. I hope you'll try to make one of these for your next party, you are sure to get lots of compliments, I always do (mostly people asking how to make them,) now you all know. Where did you purchase the tube and base? Cute decoration. It Reminds me of a lamp. :D Thanks for sharing how to make it step-by-step.